This inspiring, interactive journal encourages readers to explore what they've been thinking. In her instant #1 New York Times bestseller I've Been Thinking. . . , Maria Shriver shared her own insights, thoughts and prayers, and the ways she has learned to create a deeper, more spiritual and more meaningful life. 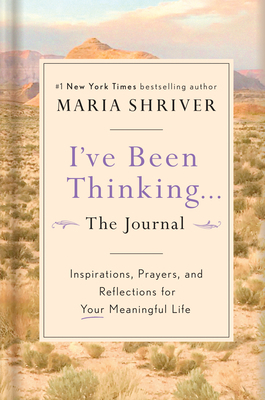 With an inspiring new introduction and creative, thought-provoking prompts, and complete with many of Shriver's own prayers and quotes, it's a perfect companion to I've Been Thinking. . . and gives readers the space to reflect on what a meaningful life looks like to them. Maria Shriver is the mother of four, a Peabody Award-winning and Emmy Award-winning journalist and producer, the author of seven New York Times bestselling books and a bestselling coloring book, an NBC News Special Anchor, and founder of The Women's Alzheimer's Movement. With more than 3 million followers, Shriver has an incredible platform from which to champion issues from women's empowerment to economic entrepreneurship and social justice. When she's not thinking or writing, she can be found hanging with her kids. "I've Been Thinking. . . is one of my favorite books of all time and this journal is the perfect companion. It's a great way for us all to think about our lives."